30 days of human comms #59 Transport for Greater Manchester road signs – The Dan Slee Blog » LOCAL SOCIAL: Is it time for a Local localgovcamp? Original source – The Dan Slee Blog » LOCAL SOCIAL: Is it time for a Local localgovcamp? 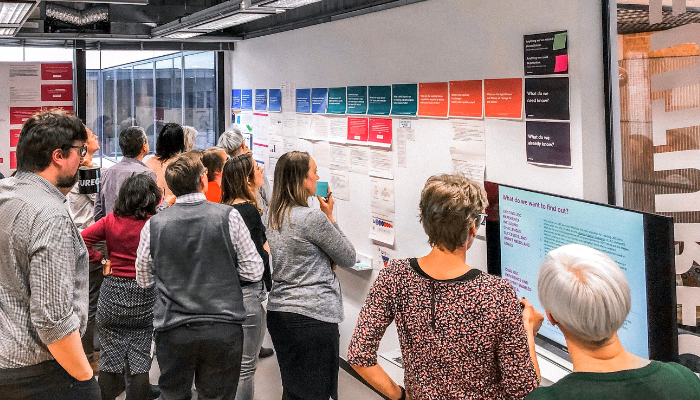 The strategic Service Design for Digital Urgent and Emergency Care is a 6-month project to identify where digital has the potential to make the most impact across urgent and emergency care, using a human-centred design approach. We’ve had a very productive kick-off sprint with our partners FutureGov. The next 6 weeks are all about research and engagement with staff and patients. As well as mapping what we already know about people’s end to end journeys from existing research and data. All of these locations also have relatively high levels of health inequalities. Within each location we’ll be visiting a range of care settings, from GP practices to major A&E departments, observing how care is delivered and talking to patients and staff about their experiences. If you work in one of those service areas and could help with arranging a visit, please get in touch with Rich Cassidy at FutureGov for further information. There are, of course, other groups we could have included. In particular, adults and children with long-term conditions, like COPD, and people with learning difficulties. They also need the care to adapt to their circumstances and do not have to constantly repeat that information for each new person they encounter. For now, we’ve decided not to expand the in-depth research to cover these. But we would be interested in speaking to people with expertise with those groups, so we can capture those issues in our wider findings. We can then determine if we need to do a deep-dive with these groups in future. Get in touch with Sophie Dennis or Joanna Choukeir if you’d like to chat through any of the work. Weeknotes 1: Kick-starting the work was originally published in FutureGov on Medium, where people are continuing the conversation by highlighting and responding to this story. “Just work your magic”, I recently told my hairdresser. It’s what I usually say, and he always does. I certainly don’t except him to send me to be shampooed and go into the back room to slag me off. Equally, I took cuttings from magazines and some rough sketches to my wedding florist. I would’ve been shocked to see her roll her eyes at my attempts to show what I was looking for. The physios who sent a draft poster with way too much text who’d had a stab at laying it out for you. The social workers who asked you to make their campaign video go viral, like that Lad Bible one. The mental health crisis team who asked you to “do a comms”, an all-user email, thanks. The LGBT+ group who drafted a press release for you put in the local paper, please. Their attempts are well-meaning. And to them, we do indeed do magic. We have skills, training and experience in something they can’t do. Their inability to do comms keeps us in jobs. They let us add value and prove our worth. Why then do we criticise and mock the way our colleagues ask us for help or present their ideas? I’m not saying there isn’t a place for sounding off with our peers. The support you can get from the comms community is astounding and, on certain days, it’s very much needed. But there’s a vast difference in reaching out for a sense-check, kind words, or advice and just outright laughing at someone’s request. And this isn’t just about kindness and professionalism. Never before has it been more important to demonstrate the worth of public sector communicators. I’d argue that every time we mock someone for their comms attempts we’re implying they ought to know better. They ought to be able to do it without us. Which leaves us where exactly? Handing over the proverbial wands and passing the P45s around. There are, of course, plenty of occasions when people think they can do your job just as well as you can – if not better. This post isn’t intended to tackle that, we have a whole toolkit for that type of tricky customer. I just wanted to question why we sometimes ridicule well-intentioned efforts of our frontline colleagues. So instead, when you’re presented with a draft – that makes your eyes bleed and your souls weep – treat it as an invaluable opportunity to add value. Begin by asking what they’re trying to achieve and what they know about their audience. Don’t be too precious that they’ve stretched the logo, you can resize it and nobody dies. And ignore the dire clip and word art, for now. Educate your client (because that’s what they are, wherever you work). Show them what your magic looks like and teach what you need from them to do your very best tricks. And always, always, look for the golden thread. What links you to the frontline? What can you do in that situation that could ultimately save, change or improve lives? Spend time looking for how to add strategic value, rather than wasting time on unkind mockery. Sure, vent with peers when you need to – we all need to – but perhaps think twice when you share with your team or post on a forum that someone’s been an idiot today because they couldn’t do your job. Could you do theirs? Have empathy and call it out when a comms colleague doesn’t. At the end of another cracking cut, I asked my hairdresser if he minds me asking him to work his magic. Guess what happened in New Zealand this week when a news story broke about Treasury civil servants playing a card game that featured ‘sun feelings’ and ‘moon feelings’? The playing cards were part of a staff wellbeing initiative to help people be more empathetic at work and have different conversations with colleagues. What could have happened next was that a Treasury spokesperson robustly defended the cards, saying it was important for staff to get support around wellbeing, and that this was a low-cost approach that used a different and fun way to challenge entrenched patterns of behaviour. That wasn’t what happened. Catherine Mangan and I are in New Zealand as guests of ANZSOG. We’ve been talking at various events about the 21st Century Public Servant research (although we’ve not said much about our own playing card game lest it provoke further ire). In all the conversations we are having with public service leaders and managers, we all agree how important it is to take risks, do things differently, shift modes of thinking. ‘Seek forgiveness not permission,’ we say, and everyone nods. But if we can’t be brave about the tiny little things – like a staff card game that uses some different language (and which its designers link to Maori metaphors) – how can we possibly expect staff to be willing to take risks on the big stuff, on the different ways of working with communities, of supporting families with complex needs? I’m dismayed that it remains so hard to be brave even about the tiny things that government does that are a bit different. Although this issue is in New Zealand, we are all aware of similar types of stories from our own jurisdictions. The stories that make you think: that’s a handful of public servants who took a bit of a risk and are now being flayed for it. They won’t make that mistake again. FACE NUMBERS: 10 reasons why every communicator needs to take Facebook seriously in 2019 – The Dan Slee Blog » LOCAL SOCIAL: Is it time for a Local localgovcamp? Fast growth is tough. It’s uneven. Disproportionate growth in some areas, puts strain on others which then need to catch up. It brings lots of challenges and frustrations but you’re also excited about what comes next. I could be talking about teenagers… but I’m talking about my experience of being part of dxw’s growth. This week marks my 2 year anniversary here and during that time we’ve grown from 25 people to nearly 60. The fact I’m talking about it is a spoiler that everything is going ok. But I want to share some of the things I’ve learned along the way. Growth introduces new people and new behaviours and starts conversations about new ways of working. All of which are fundamental to a healthy team. If you’ve hired lots of smart, enthusiastic people then it’s likely that there’ll be lots of pretty wide-ranging ideas about what you should be doing. You can’t act on all of them. It’s important to use your company values as your anchor and refer everything back to them. Put yourself out there – even if you don’t know where there is! 2 years ago, dxw was predominantly a white, middle class and male-driven organisation. To build services real people use, we needed real people to help us build them. We knew we needed a much more diverse team. At the time, our recruitment just wasn’t reaching the right people. We had to take some bold actions and step out of our comfort zone into forums and networks we didn’t really know much about. We sponsored events and stood in the corner looking utterly lost. We attended recruitment fairs and stood in the shadow of ASOS and Tesco. We started advertising in new places, only to be met with a wall of silence! It was sobering and expensive at times, but we did have some success attracting people to our mission who wouldn’t have known about us before. Crucially, we started to learn and gather momentum. Although there’s still plenty more to do – we’ve just launched our Returners’ Programme, for example – we’re now pretty proud of our increasing diversity. 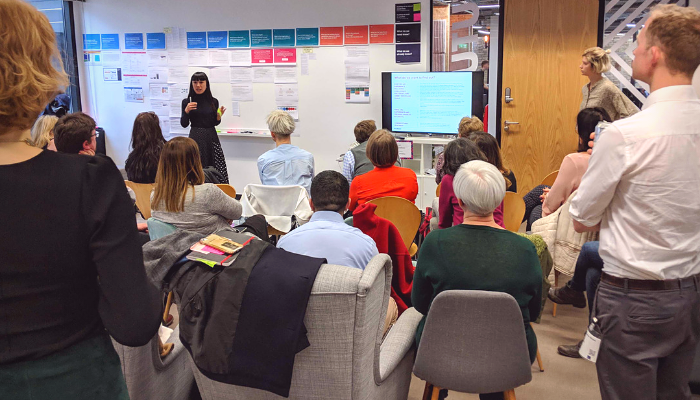 For the first time, we have roughly the same number of women and men working with us (we’ve almost trebled the number of women at dxw since 2016). The easy thing to do when you’re faced with a daunting recruitment plan is to double down on process. Get the cogs lined up and crank the wheel. While it’s important to get your processes working quickly and smoothly, it’s a mistake to focus just on that. The diverse range of skills and experiences we’re looking for has meant we’ve needed to iterate our approach to give all candidates the best possible opportunity to show their talent. We’ve tried a number of approaches, for example, for our work simulation activity (the last stage), sometimes giving candidates advance notice of the task, and at other times, a mere 15 minutes if that’s a better fit to the vacancy. We always offer an informal lunch with some of the team after the worksim. That suits some people, and helps them get to know us better, but not everyone feels comfortable with that so it’s entirely optional. Above all, we always think about how to put people most at ease. Basically, put people over process wherever you can. This is tough one. Long before I joined 2 years ago, dxw had a reputation for openness with a “great culture” (see exhibit A: the dxw playbook) centred around our values. But whilst many of our organisational behaviours have remained, some haven’t aged that well as the company has tripled in size. We’ve put a lot of emphasis on building an inclusive culture, and leaders need to constantly reaffirm and nurture that, particularly when change is continuous. The trickiest thing has been creating an environment and the space for people to feel comfortable to challenge something that’s the “norm”, and not necessarily broken but needs refreshing. That’s even harder when the people who are the best gauge of these things, are often the ones who have just joined us. In our delivery projects we don’t settle for “just ok”, nor do we accept excuses of “that’s how we’ve always done it” from clients. So we don’t accept this of ourselves. Each Friday is a ‘dxw Friday’ where everyone works together on the things they want to fix. We also have an annual retreat and regular company-wide retros where everyone owns the agenda and actions. But we need to keep reviewing these approaches all the time. As we continue to grow, I want us to get better at fostering an environment where new joiners not only ‘get’ our culture, but feel they can contribute to it straight away. I couldn’t sign-off without a plug. We’re still recruiting! If you’d like to join us and help us keep doing things better, please get in touch. Our current vacancies are on our website and we welcome general approaches too. The post Fast growth is tough appeared first on dxw digital. 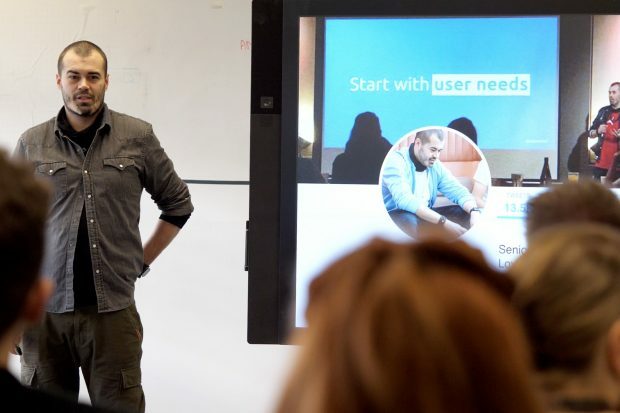 We’re really excited to be holding a day of tech talks at this year’s Leeds Digital Festival! If you’re interested in how we’re using design, data and technology to tackle some of the UK’s biggest digital challenges, come along and find out more. You can just come to 1 event or all 3 if you like – it’s entirely up to you. The first tech talk kicks off 10am with a session from Euan Gillespie, Head of User Research. Euan will give an introduction to User Research in a government context, covering approaches, techniques, and common challenges – all framed around case studies from DWP projects. He’ll also share his tips on developing a User Research community of practice. Then it’s over to data scientists Penny Pegman and Paul Ainsworth whose interactive session will demonstrate how we’re using data visualisation to enable evidence-based decision making when developing and improving our digital services. Finishing up the day is Senior Interaction Designer Craig Abbott, who will talk about how to design accessible services that don’t disable people. He’ll give examples of things that have tripped him up in the past as well as suggest tools to help test designs. And in true Yorkshire style, there’ll be time to have a brew and a chat with the presenters following each session! We’re really passionate about being part of the growing digital community in Leeds. Our buzzing digital hub in the city centre is full of digital professionals working together to make DWP’s services simpler, faster and more user-friendly. Over the next year we’ll be recruiting over 130 digital specialists into our Leeds hub, so the day is also a good opportunity to find out more about the roles we have on offer. Most of last year’s sessions sold out really quickly, so make sure you register for your free tickets today. This White Paper is the government setting out its policy to tackle “online harms” such as extremist content, “fake news” (or “disinformation”, as it’s referred to in the paper), child abuse and other elements of the internet that put many people off using it altogether. As a result of this White Paper, internet companies could be fined, or even blocked, if they fail to tackle issues on their platforms. They are hoping to do this through establishing an independent regulator who will draw up a code of practice and giving it the power to fine non-compliant companies – including possibly fining their chief execs – or block sites that break the rules. There are concerns about freedom of speech implications, however, when looking at the paper from the view of encouraging digitally excluded people to get online and enacting social change through digital, it’s hard to see this as anything but a positive step forward. It’s important that whilst online harms are taken seriously, that they are understood. One in five non-internet users don’t go online because they don’t trust the internet, or don’t feel it’s online or secure. The internet can be a frightening place, especially for those with low self-confidence in using technology. However, letting fear of the dangers of digital stop someone from using it or, in the case of parents, restricting childrens’ use, is counterproductive to their life chances and the potential for our society and our economy. The benefits of digital far outweigh the dangers. The economy is becoming more reliant on digital and digital skills are increasingly becoming vital for competing in the job market – and on top of this, people can save £744 a year by just being online and being able to shop around better for goods and services. Those who are shutting themselves off from the online world are putting themselves at a disadvantage, and we need to tackle why some people are frightened of the internet and how we address these concerns. At Good Things Foundation, we know full well just what a concern online safety can be for people who are digitally excluded. Because of this, we’ve developed a number of internet safety courses on our Learn My Way platform, which helps people tackle online harms. We know better than anyone that media literacy support is incredibly helpful for adults for a number of reasons, and especially tackling online harms. 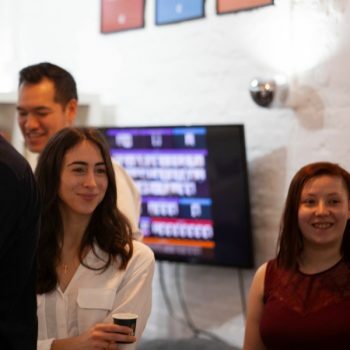 If we want to truly unlock the potential that a fully digital UK could offer, then we need to bring about a society with higher levels of digital skills, and less technophobia – an important pillar in bridging the digital divide, that we are so passionate about.